otherwise. This product makes it easy and convenient to get some fruits into my system. Del Monte Fruit Cocktail includes a variety of peaches, pears, grapes, pineapples, and cherries. You can get it now in a light syrup or the traditional heavier syrup. In addition to the traditional can, it sometimes can be purchased in individual-sized cups, which is how I prefer to buy it when I can. When in doubt, though, it’s always available in cans. a very tasty one-hundred calories. The fruit is fresh and tender. It’s juicy and makes you want to savor the taste in your mouth. I just love it. These fruits make a cooling fruity combination that is healthy as well as filling. One serving goes great with most any meal, or eaten as a snack. Del Monte Fruit Cocktail is fat-free and doesn’t contain any preservatives. It’s also packed in the USA. 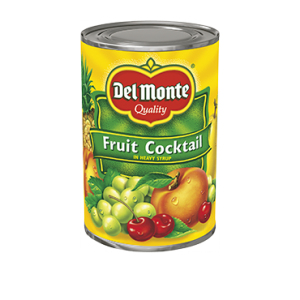 I love Del Monte Fruit Cocktail, and it’s something I try to make sure I have on hand frequently.